After about 19 hours travelling we arrived at Tucson airport. 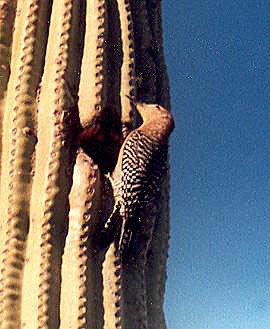 Our first Arizonan birds were seen in the airport carpark – Great-tailed Grackle, Cactus Wren, Mourning Dove and Gila Woodpecker – what can you expect from somewhere with saguaro cacti in carparks? We were staying at Tanque Verde Ranch, east of Tucson, about half an hour drive from the airport over very undulating roads. We checked as many birds as possible from the car, almost all of which turned out to be Mourning Doves (although we did see a couple of Chihuahuan Ravens). 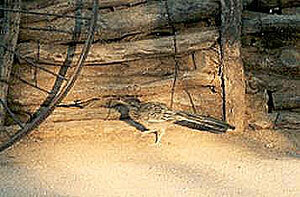 However, as we drove into the ranch we did get our first Greater Roadrunner – a great start. After we had dropped off our luggage we did what any birder would do – we walked around the immediate area to see what was about. From about 5.30pm until 6.30pm we walked only a few hundred metres around the various guestrooms of the ranch. The area is quite well planted with trees and cacti. On this little walk we saw male and female Northern Cardinal, many Cactus Wrens and Mourning Doves and our first White-winged Doves. The first song we heard was one we knew - Rufous-winged Sparrow. We didn't think we'd get this bird but here we were starting off the trip with one singing on a bush about 5 metres in front of us. Once we were sure of this bird we carried on down the track getting Gila Woodpecker, a male Lark Bunting, a pair of Gambel's Quail, Verdin, Curve-billed Thrasher and a Black-tailed Gnatcatcher (the only one of the trip). Further round the road, towards the 'office' we added more Gambel's Quails and Curve-billed Thrashers plus Phainopepla, House Finch and Cassin's Kingbird. We also saw three species of hummingbird, two of which just shot past too quickly to identify, one sat still for a bit and we managed to identify it as Broad-tailed Hummingbird. Back in the room I looked out of the bathroom window and saw a male Hooded Oriole feeding on a flower just outside. That night, actually about 2am, I awoke to the sound of snuffling outside the room. I looked through the window and saw a large adult Javelina (Common Peccary) scoffing our seed supply (kindly provided by the ranch for our bird table). I chose to let it carry on and went back to bed. We did a quick walk around the buildings again getting Verdin, Cactus Wren, Gila Woodpecker, Great-tailed Grackles and our first Black-headed Grosbeak, Lesser Goldfinch and Bronzed Cowbird (the red eye obvious even at a distance). We stopped outside the nature centre to check out the hummer feeders. As we waited a Greater Roadrunner hunted next to us, then ran across in front of us and disappeared under a bush. Hummers soon began to turn up and we saw Anna's, Broad-billed (commonest hummer of the area), Broad-tailed and Black-chinned Hummingbirds. Continuing back towards our room and checking some wooded areas we added Yellow Warbler, Bell's Vireo (very common - at least, heard a lot), White-crowned Sparrow, Rufous-winged Sparrow (again) and four wheeling Turkey Vultures (TV to the locals). Of course House Sparrows were common here too. 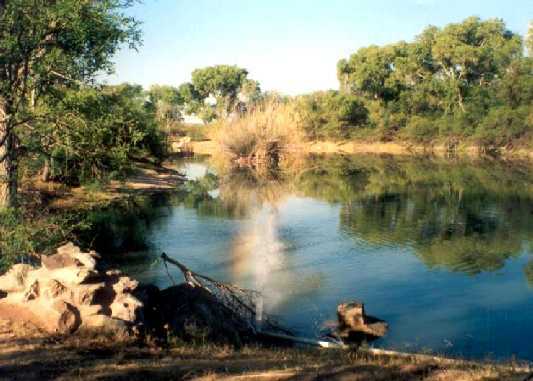 The ranch has a small lake (Lake Gambusi), surrounded on one side by thick cottonwoods and on other sides by scattered trees. Here we saw lots of Phainopeplas (flycatching over the water), Common Yellowthroat and Violet-green Swallow. A highlight was finding first a female, then a male Vermilion Flycatcher, both showing very well. Also here we saw one male Red-winged Blackbird flying overhead and got quick views of two Hepatic Tanagers. Western Kingbird was easy to get as were more Curve-billed Thrashers. A Song Sparrow was heard singing from the reeds. Moving back towards the ranch buildings we came across 'The Ramada'. This is part of a nature trail comprising benches, feeders and scrub. Here we had loud Brown-crested Flycatchers, Broad-billed and Black-chinned Hummers, Bewick's Wren, Lucy's Warbler and one Grasshopper Sparrow. This was our 'do the ranch' day so we walked away from the buildings into the saguaro desert (actually up to the Old Homestead where breakfast cookouts are sometimes held). The habitat comprises the saguaro, prickly pears, cholla, ocotillo and various small scrubby bushes. This was good desert sparrow land and we saw a pair of Black-throated Sparrows, Cassin's Sparrow, Rufous-crowned Sparrow and at least two Ash-throated Flycatchers plus the usual Gila Woodepckers. The heat was pretty tough by then so we lounged on the loungers on the porch of our room, keeping binoculars handy - a good idea here. The 'lounge' added Common Raven, Ladder-backed Woodpecker and Gilded Flicker, plus more of the usual species such as White-winged Dove, Northern Cardinal, the towhees and a male Broad-billed Hummingbird which spent quite a lot of the week sitting on a nearby bush. By the end of this, our first full day, we had had 52 species of which 37 were lifers for both of us. We decided we really liked this place! Day 3 began with checking the area outside the room. After the 'usual' Canyon Towhee and White-crowned Sparrow we had another lifer – Lark Sparrow, two feeding just beyond the bird table. The idea was to check out the lake area again. On the way we stopped to check the well-watered grassy area outside the Nature Centre, which looked likely to attract birds. 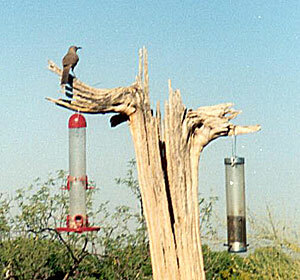 Here we had Hooded Orioles and our first Inca Doves – two feeding on the ground. Down at the lake we added Phainopepla, Lucy's Warbler, Gila Woodpecker, Yellow Warbler, Ash-throated Flycatcher, Curve-billed Thrasher, Brown-crested Flycatcher and Northern Cardinal. The male Vermilion Flycatcher was on his usual tree top, occasionally flying up to sing and display. A surprise was an adult Black-crowned Night-heron which flew up from the water's edge and landed in a tree about 50 metres away. The nearby path towards Cottonwood Grove added a male Costa's Hummingbird, Black-headed Grosbeak, Gambel's Quail, Wilson's Warbler, Northern Rough-winged Swallow and Brown-headed Cowbird. Both Hooded and Bullock's Oriole were seen around here as were Verdin, Lesser Goldfinch and Bewick's Wren. Back up at the Nature Centre we met with Jerry, one of the ranch's naturalists, who was going to lead a nature walk. We began with Turkey Vulture, Greater Roadrunner and Broad-billed Hummingbird and soon added a pair of Killdeer on the edge of a small (2 metres widest), foul-looking puddle in the corral. Jerry took us to an area he called Casa West, mostly riparian habitat on the edge of a wash. Our first bird here was Vermilion Flycatcher, soon followed by a male Townsend's Warbler and three Red-tailed Hawks (all three very pale birds). A Say's Phoebe was seen at the wash's edge then Jerry spotted a very distant hummingbird which was, we were told, a Magnificent Hummingbird. How he spotted this small bird at that distance we'll never know. Further into the cottonwood trees we came across a fine male Black-throated Gray Warbler, a Tennessee Warbler and three Green-tailed Towhees. We also had yet another pair of Vermilion Flycatchers. A group of birds suddenly flew up from feeding on the path. These turned out to be a flock of about six Lark Sparrows – a species we expected to see in open fields, not in a wood. At what was described as 'an old film set' was a large abandoned wooden building which held a roosting Great Horned Owl. However quietly one approaches the owl will always hear you and it flew out in front of us before we could look in. Still, we weren't complaining! Later, from our room, we again had Rufous-winged Sparrow (I thought these birds were hard to get!) and added three male and one female Brewer's Blackbird. Jerry had told us that the lake was good for Black Phoebe and he couldn't believe we hadn't yet seen one (or more). At 4.05pm we went back to the lake for a concerted effort to find this bird. After about ten minutes we found a male sitting on a bush, quite in the open, but very hard to see unless he moved. We went on to see the usual birds for the lake plus two Cooper's Hawks and Ladder-backed Woodpecker. On our last full day at the ranch we revisited most of our favourite places. First was the usual check of what was on the birdtable and just outside the room. Saying 'just outside the room' shows what a good place this is – the list was: Rufous-winged Sparrow, Northern Cardinal, Cactus Wren, Gila Woodpecker, Curve-billed Thrasher, Yellow and Lucy's Warblers, White-winged and Mourning Doves, Gilded Flicker, Chihuahuan Raven, Northern Mockingbird, Broad-billed Hummingbird, House Finch, Gambel's Quail and Lark Sparrow – a heck of a list for a British birder! We stopped at the Ramada where we had Verdin, Brown-crested Flycatcher, Gila Woodpecker (nesting in saguaro), Curve-billed Thrasher, Broad-billed Hummingbird, Brown-headed Cowbird (by now far outnumbering the Bronzed Cowbirds), Gambel's Quail, Northern Cardinal, White-winged Dove, Phainopepla and Black-chinned Hummingbird. Back at the nature centre we watched the hummer feeders where Black-chinned, Broad-billed and Broad-tailed Hummingbirds fed. Also seen around here were Common Raven, TV, Hooded Oriole and the two doves. Next stop was Casa West. The Great Horned Owl again appeared from the 'movie set' and we listened to a singing Bronzed Cowbird – sounding quieter than we expected it would, but still very distinctive. I saw three distant birds which, surprisingly, turned out to be three Snowy Egrets – got to be good for a desert list – plus Phainopepla, Cactus Wren, Purple Martin and Hooded Oriole. We headed into the woods where we saw Western Scrub-jay, saw and heard a close Northern Mockingbird, saw Verdin, Bell's Vireo, Lark Sparrow, Wilson's Warbler, Vermilion Flycatcher, Lesser Goldfinch and Green-tailed Towhee. The Red-tailed Hawks were again on the nest and nearby we had Bewick's Wren and Abert's Towhee. On the way out, where woodland becomes desert, we heard a simple but loud song. The bird was close but hard to see in a bush. After a few minutes it came into the open and we had what was by far our best view of a male Pyrrhuloxia – best bird of the day. Back by the road we added Brown-crested Flycatcher, Greater Roadrunner and Lincoln's Sparrow. Later that evening, after the cook-out, we walked up the road a bit towards Casa West. It was about 7.20pm and we heard both Elf and Western Screech-owl, saw the Snowy Egrets again, and saw Ash-throated Flycatcher, Rufous-winged Sparrow and Canyon Towhee.